The project team is happy to announce myWSU has the new homepage look and feel. Please take the time to familiarize yourself and let us know if you have any questions! We are working to streamline navigation and get students to the information they need faster. 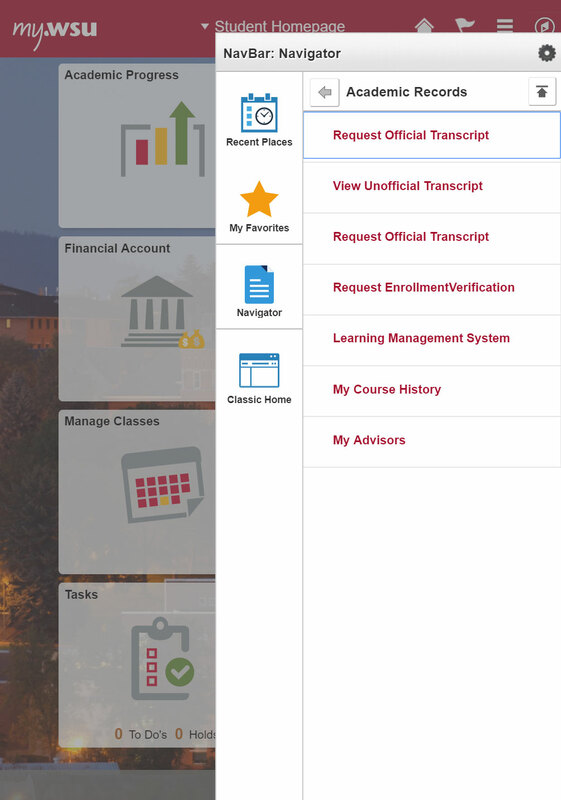 Upon login to myWSU, the first thing students will see is their Student Center notifications of unread emails, holds, to-do items, and any charges due-right from the home screen. Academic Advising – Review items such as advisor contact information & notes from advisor, academic progress reports, and application for graduation. Academic Records – Pages available by clicking on this tile include grade history, GPA, and transcript request forms. Financial Account – Make a payment, review charges, or set up direct deposit. Financial Aid – We make it easy for students to review financial aid awards here! Manage Classes – Search for classes, build schedules, review current class list & weekly schedule. Profile – Students will still be able to easily review and update all personal & contact information. Tasks – This tile offers information on any holds or to-do list items. My Comm Center – Students can review any official WSU emails or letters sent through myWSU. Your myWSU homepage is changing, but everything else will remain the same. Just like all other pages within the new myWSU, your favorites link will remain readily available. One new feature that may catch your eye is the Faculty Center tile. This tile will serve as a shortcut to view your schedule, class rosters, and grade rosters. Since no content is changing besides the look and feel of the landing page, you can always return to your traditional navigation. Simply click on the main menu tile. Your myWSU homepage is changing, too. Not to worry, you will still be able to access all the same information you need to get the work done. Do you use favorites? Your short cuts will still be there. How does this change the way you work with myWSU? Now it is even easier! When you log in, you can skip the homepage by clicking on the main menu tile and get going. All users will also now be able to personalize their home pages by rearranging tiles and selecting information they want to see. How-to videos are coming soon! After last summer’s successful upgrade of myWSU to Campus Solution 9.2 (CS 9.2), the ITS Enterprise Systems team is preparing to roll out several exciting myWSU CS 9.2 service enhancements to students, faculty and staff. 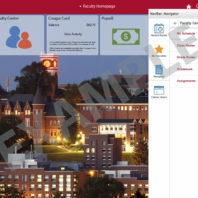 The first major MyWSU enhancement coming your way is the Fluid User Interface (FUI). 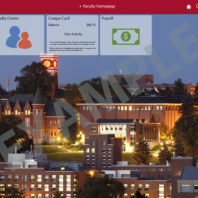 This aesthetic change will present users a redesigned homepage offering intuitive tiles for clear and efficient navigation within MyWSU, allowing information access in fewer clicks. The second major enhancement included within the new Fluid User Interface allows myWSU to be device aware. 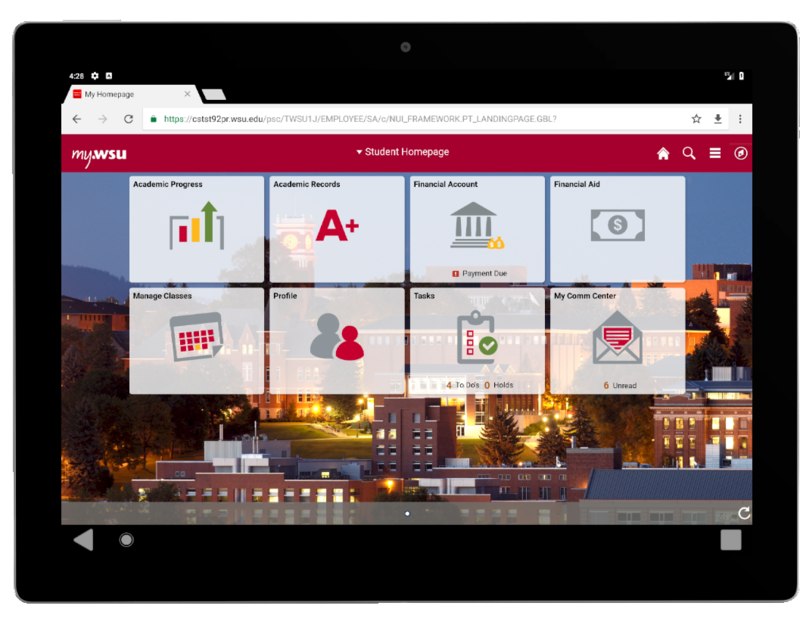 Users can log in on any device (laptop, tablet, or phone) and myWSU will resize and optimize the views presented to the user based on that device. Intuitive navigation; users get where they are going quickly and easily. Device awareness; easily view pages on any device. Optimal user experience; user-specific homepages and quick link tiles to key self-service areas. A springboard for extending the fluid design to other pages within myWSU. 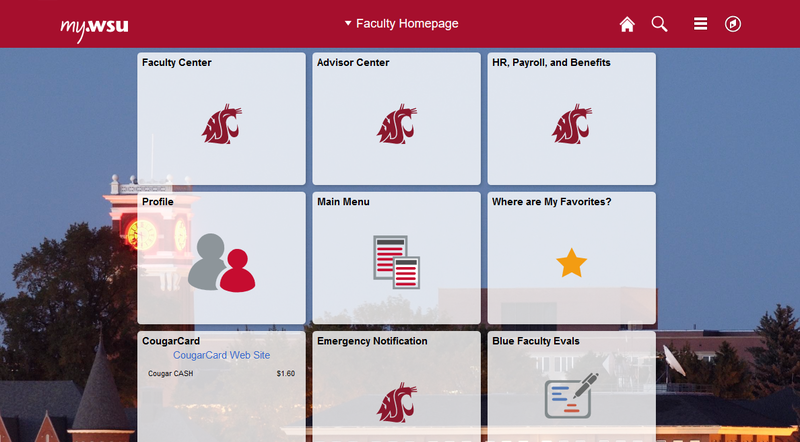 The new myWSU Fluid User Interface replaces the current user view of tabs and pagelets within the myWSU portal home page with the grid of quick link tiles based on the role you have within the university (student, faculty, or staff). When will the new Fluid User Interface homepage be available for users? 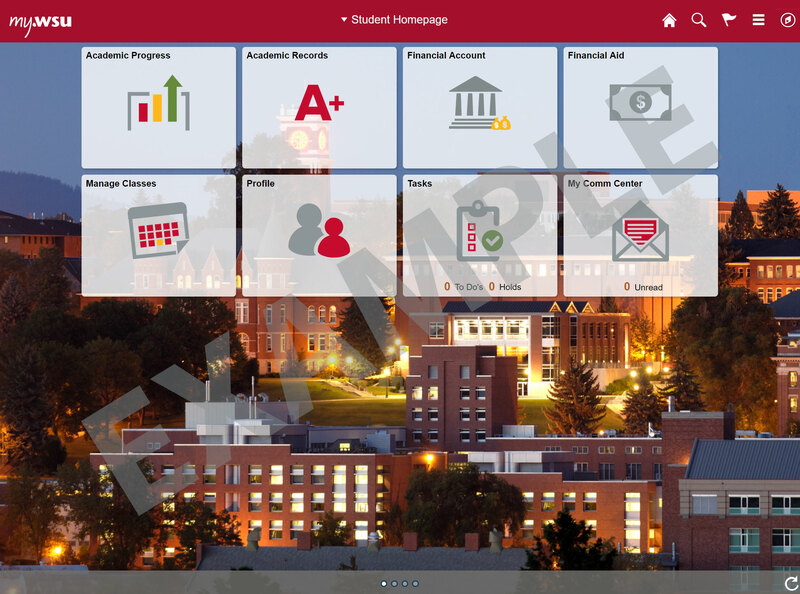 How will I navigate within the new myWSU Fluid User Interface homepages? 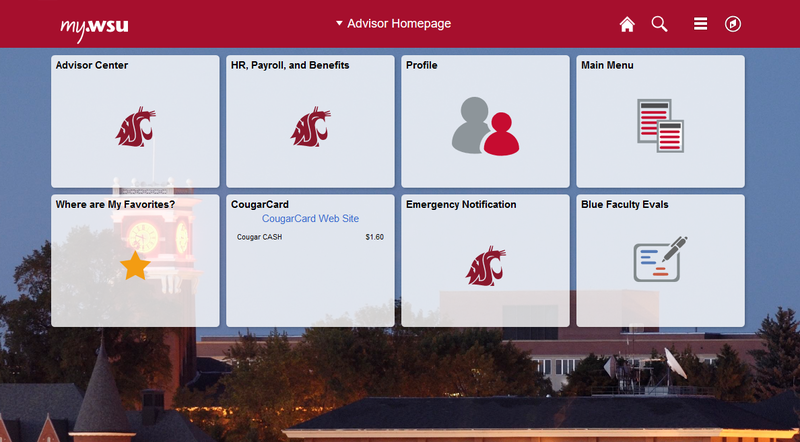 The Student Homepage will contain tiles such as Financial Aid, Manage Classes, Academic Records, Academic Progress, My Communication Center, Tasks, Financial Account, CougarCard/RDA, and Housing (if living in campus housing). 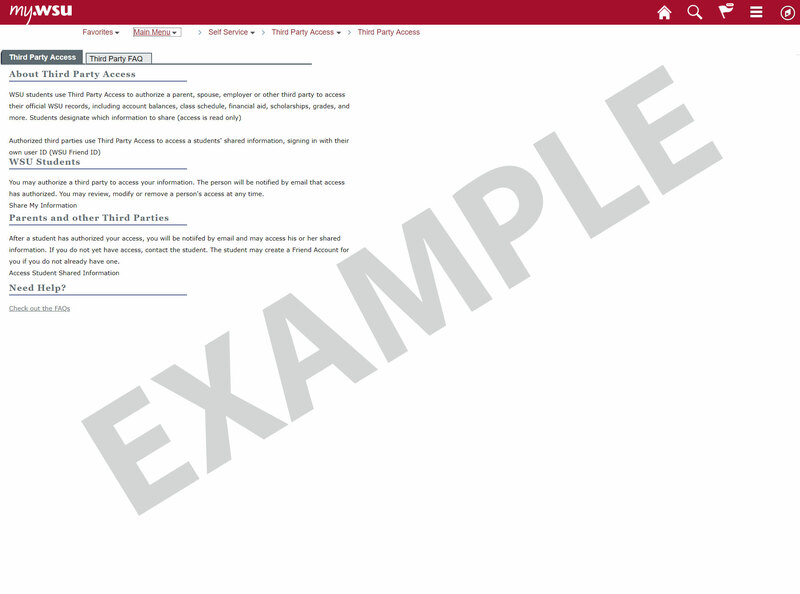 For any student support pages not yet converted to Fluid User Interface as of June 1, the page will display the classic MyWSU view currently in use. For items not included in the tile grid, students can use the simple navigator menu. 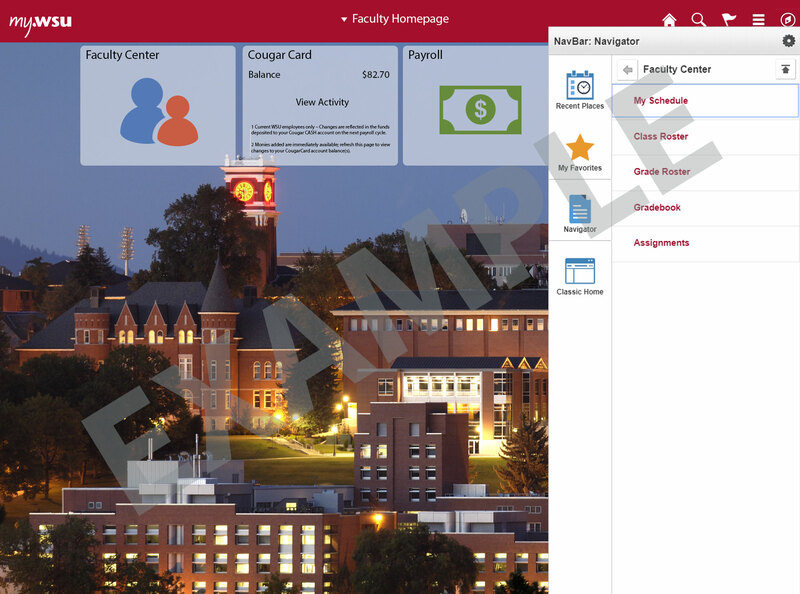 The Faculty Homepage will have a Faculty Center tile to manage tasks related to classes and grades. Similarly, the Staff Homepage will have the tiles related to your work responsibilities, and both views will have tiles to update names, address, and view/print earning statements. 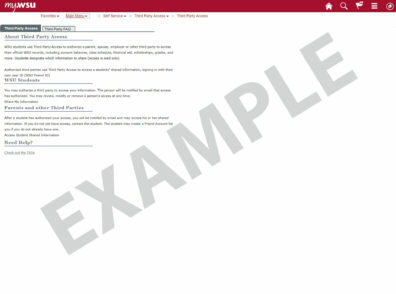 The Faculty Homepage and the Staff Homepage will replicate the information currently found in the classic view of myWSU. The portal faculty tab and faculty center pagelets along with the portal staff tabs will be replaced with homepages and tiles on July 1, 2018. 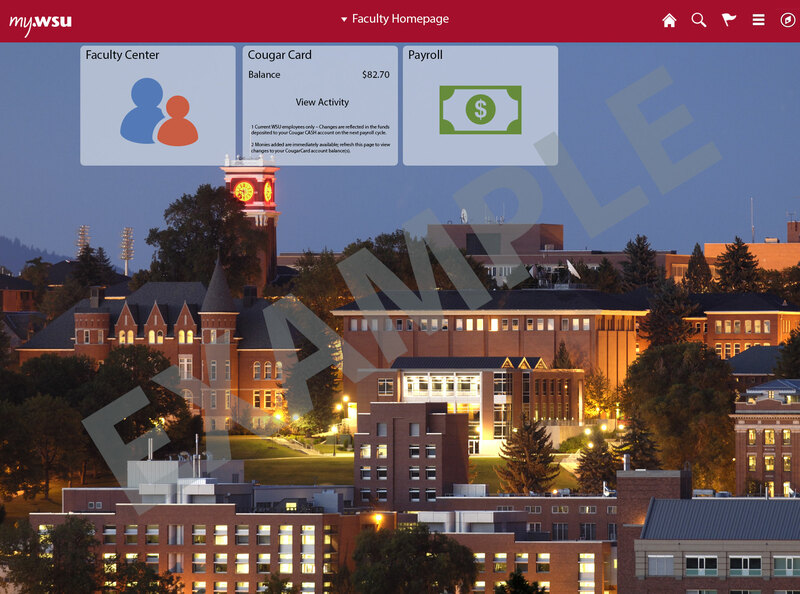 Use the navigator to get to information not represented within your tile grid, or to get back to the classic view of myWSU with the traditional main menu navigational structure. If a staff member enrolls in a class, they will have access to both the Staff Homepage and the Student Homepage. ITS will continue to provide status updates regarding the Fluid User Interface change in preparation of going live. If you have questions, comments or concerns please contact Enterprise Systems at enterprise.systems@wsu.edu.